This morning I witnessed a sight I have never seen before. From the moment I walked out my door to the moment I walked into work, there was a steady stream of snow geese within my sight. 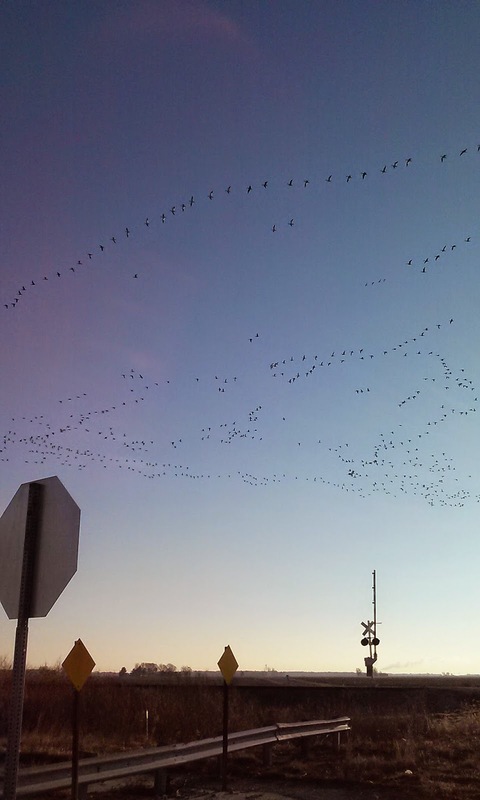 There were thousands of them, flying in a line for as far as the eye could see! It was amazing. I had to stop several times to take pictures of them. This doesn't even do it justice because you can't see the long line on either side. YES YES YES!!! I saw them too!!! I have seen this kind of sight several times in my lifetime and it is absolutely amazing!! So glad you saw that too, I was trying to find someone else who had seen it, so glad it is YOU!! !